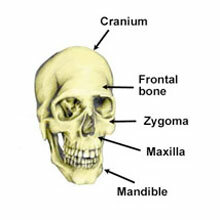 Skull fractures occur due to an impact to the head from either a blunt or sharp object. Common examples in sports include collisions between players in contact sports such as rugby, where fractures to the cheekbones and nose are common. A simple fracture is a break in the bone which is not dislodged in any way and doesn’t break the skin. A depressed fracture occurs when the bone is crushed and part of it is moved in towards the brain. A compound fracture occurs when the bone breaks the skin and splinters. The most serious injuries occur when the fractured part of the skull comes into contact with the brain. This can cause temporary or permanent disability or even be fatal. Bleeding from the wound, eyes, ears or nose. Bruising behind the ears or under the eyes. A straw coloured liquid draining from the eyes or ears. NOT allowed to continue with sport or allowed to drive. Made to rest, in a seated position with the head elevated above the heart. Referred for medical attention as soon as possible. NOT given any food, drink or medication before seeking medical attention. In cases where the athlete is unconscious, an ambulance should be called immediately. The patient should NOT be moved in case of associated spinal injury and to prevent movement of any bone fragments. DO NOT attempt to remove any fragments of bone, just observe the patient until medical help arrives.